Given the popularity of Halloween Horror Nights and the draw of big-name haunted houses, it can seem like there really aren’t any “slow” nights anymore. This is why Horror Nights early admission, which used to be a fun trick for insiders, has now become a necessity for any guest who wants to go to the event and experience the haunts with only a sensible amount of waiting – with or without Express Passes. On this page, we’ll explain how any guest can get early entry to HHN 2018, and we’ll show you exactly what that looks like. IMPORTANT: The information on this page is based on our daily observations, as Universal representatives have historically chosen not to provide the details of the event’s various holding areas (more about which in just a moment), which is more than likely due to the situation being subject to change on a nightly basis. Before we get into the nuts-and-bolts of how early entry to Halloween Horror Nights works, let’s first take just a quick moment to answer a few basic questions – it’s important for all of us to be on the same horror page in order to fully soak up every last bit of time-saving information. Who qualifies for HHN 2018 early admission? Contrary to popular belief, anyone who has admission to Universal Studios Florida during the day and HHN admission for that evening can use the early-entry feature. 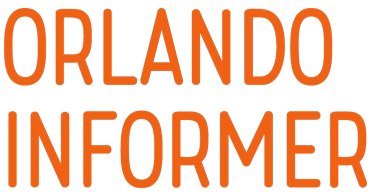 It isn’t restricted to guests who purchase special packages or tours or those who win the lottery – if you are in the park during the day and your Horror Nights ticket grants you admission to the event that evening, you qualify for early entry. Yes, it’s that simple. Can I get HHN 2018 early admission without a daytime ticket? Unfortunately, you cannot – having admission during the day is the one and only qualifier. 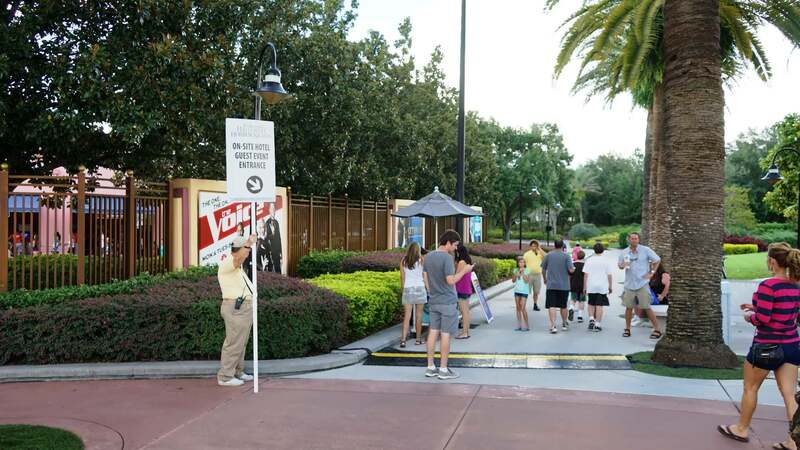 However, it’s worth noting that on-site hotel guests have a special entrance for HHN general admission, to the right of the Universal Studios Florida gates. This does not grant on-site hotel guests early access to houses like HHN early admission does (which we’ll explain in a moment), but it may help you skip some of the general-admission crowds at the park turnstiles. Okay – now that we’ve gotten the basics out of the way, it’s time to dive head-first into our early-entry explanation and guide. By 5:00 pm, you need to get yourself in line to “check in” at the holding area. The check-in process itself is simple: you present your HHN ticket for the night, it’s scanned, and, if it’s valid, you’re in. Now is a good time to mention again that you don’t need a special ticket to use HHN early admission. When you’re checking in, they don’t care how you got into the park earlier in the day (you could have a one-day ticket, you could be an annual passholder – doesn’t matter), and they don’t care what kind of Horror Nights ticket you have (one-night admission, Frequent Fear, whatever), as long as your ticket is valid for that night. Between 5:45 and 6:00 pm, the crowds in the holding areas are let out to start touring the haunted houses. While only one or two houses are accessible from each holding area immediately, this is an awesome way to see these houses with essentially no waiting. See how easy it works? Ultimately, this is the best way to jump-start your Horror Nights touring. 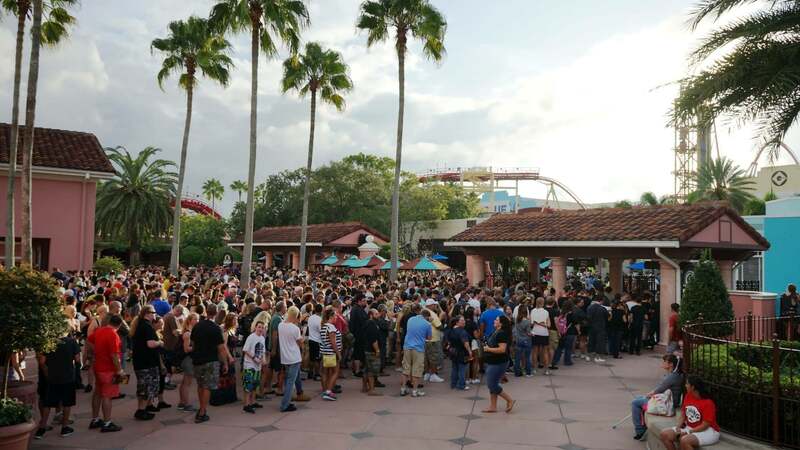 If you’ve studied Halloween Horror Nights before, you may be aware that general-admission guests are often let in through Universal Studios Florida’s turnstiles as early as 6:00 pm. This may lead you to wonder, “If I’m getting let out of a holding area at 5:45 and general guests are getting in at 6:00, is HHN early admission really only 15 minutes?” In terms of minutes on a clock, yes, you are right – but HHN early admission is more about the following two factors. First, even though you may only be let out of a holding area 15 minutes or less before general admission gets in, during those 15 minutes you should be able to get through one haunted house and then get to the front of a line for a second. Essentially, you’re able to visit at least two houses with no waiting – and since there are only 10 houses in total, you’ve just knocked out 20% of them. Just as importantly, with two houses visited by 6:15, you’re then in a great spot to continue on to the less-popular houses, which won’t get long lines until much later in the evening. So, even without Express Passes, it’s not unreasonable to get three or four houses done by 7:00 if you move quickly and know what you’re doing (in other words, use HHN early admission and our touring plan). The second factor is that, if you’re in the general-admission line from 5:00 to 6:00 pm, you’re basically standing in a big crowd doing absolutely nothing for an hour. That’s a terrible way to start your night (read: buzzkill). 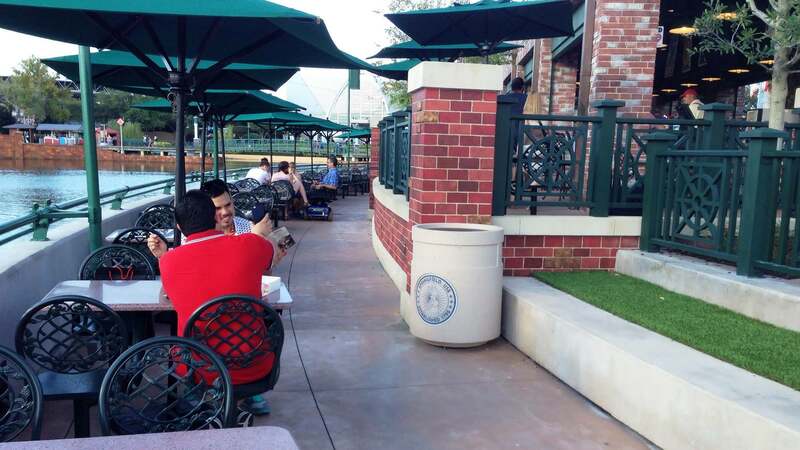 On the other hand, if you wait in an HHN early-entry holding area, you’ll have access to places to sit, you can go to the restroom without having to worry about losing your place in line, and, depending on exactly which holding area you chose, you may even be able to eat a meal or sit down at a bar. Any way you cut it, HHN early admission is far superior to general admission. Now that we all agree, let’s talk about the specific holding areas. Please be aware that guests staying inside the Finnegan’s holding area after 5:00 pm must have valid HHN admission – don’t think you can sneak into the event that night by eating at the restaurant. Stranger Things and Poltergeist. When taken with its setup, Finnegan’s earns our top recommendation for Stay and Scream. There’s plenty to do at Springfield, USA, with the following venues open for business: Duff Brewery, Moe’s Tavern, Lard Lad Donuts, and Bumblebee Man’s Taco Truck. There is also a lot of seating available, including the stretch along the lagoon. Finally, because this is a newer Horror Nights early-admission holding area, it shouldn’t be as crowded as Finnegan’s. We currently believe that the Springfield holding area will be given access to Slaughter Sinema and The Horrors of Blumhouse (though this is obviously subject to change). The Hello Kitty store holding area, located across from Despicable Me: Minion Mayhem, doesn’t have much to do, nor does it contain much in the way of atmosphere – though there should be a beverage cart (be sure to bring cash), and you can access the restrooms across the street. What makes Hello Kitty desirable is its value to your touring plan: since it’s located next to one of the most popular haunted houses every year (Halloween 4: The Return of Michael Myers is placed here this year, and Saw: The Games of Jigsaw was in 2017), it can really give you a leg up on your HHN adventure – when it’s open, that is; towards the end of last year’s event, Hello Kitty ended up becoming an overflow area for Finnegan’s (meaning if you arrived too late and the restaurant was filled up, you were sent here) instead of a holding area unto itself. Hello Kitty is, indeed, continuing its tradition of being an overflow pen for Finnegan’s – which is a roundabout way of saying that it lets out to Stranger Things and Poltergeist. Every year, Universal has a special early-access period just for its annual passholders. For 2018, this is officially labelled Scream in Early, and it’ll fall on September 14, 15, 21, and 22 – meaning that, during these dates, the Hello Kitty area will be shut down for Stay and Scream guests (if it isn’t closed already, of course). The London waterfront of The Wizarding World of Harry Potter – Diagon Alley has, on occasion, been employed as a holding area, although this location spent most of Halloween Horror Nights 2017 empty during the Stay and Scream period. When it is being used, however, it tends to be the most pleasant holding area, providing lots of great aesthetics and the most things to do while you wait for the horror carnage to begin. Diagon Alley is currently not being utilized as an early-entry holding area. Every year, Universal has a special early-access period just for its annual passholders. For 2018, this is officially labelled Scream in Early, and it’ll fall on September 14, 15, 21, and 22 – meaning that, during these dates, the Diagon Alley area will more than likely be shut down for Stay and Scream guests (if it isn’t closed already, of course). Still have a few early-entry questions for us? That’s good – we’ve still got a few answers for you! Okay, this final instruction is critical: your group needs to be inside the turnstiles of Universal Studios Florida by 4:45 pm so you can get to a holding area on time – if you show up at the park gate later, you may not get in, and you’ll have to wait with everyone else for general admission. Any tips if I can’t get HHN early admission? 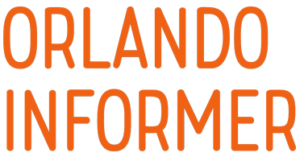 Because you’re a fan of Orlando Informer, we’ll share with you a quick secret to skipping most of the HHN turnstile line. Please keep in mind that this is not an alternative to getting early entry, as described above – if you have daytime admission, we still highly recommend you get yourself inside Universal Studios Florida before 4:30 pm. But if you don’t have daytime access to the park, this trick can help save a bit of time and get your evening tour off to a swift start. Do you really want to be stuck in a line going all the way back to the ticket windows? We don’t think so! …will have temporary turnstiles open to add capacity to the permanent turnstiles found on either side. So if you wait in the middle, where lines won’t form until guests actually see Universal team members preparing the temporary turnstiles, you will get a significant jump start! As we mentioned above, the key to this trick is timing – you need to get to Universal Studios Florida early enough. 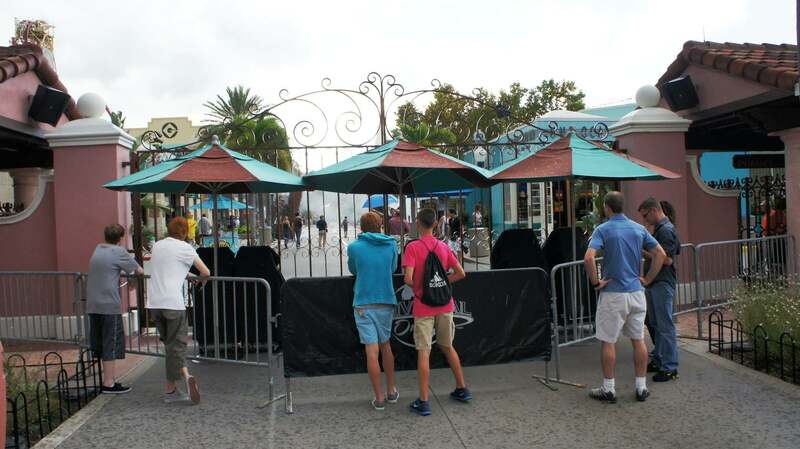 As soon as employees come out and start preparing the temporary turnstiles in the middle, all the guests in the long lines will see what’s happening, and thise area will be flooded. Do you have a question about Halloween Horror Nights? Please let us know by posting in our Universal Community Facebook group.